Dreaming of your next vacation? Thinking of staying in a vacation rental (ie. Airbnb, VRBO, etc.) instead of a hotel? Before you make your reservations, make sure you read this first! A 2018 study published in the journal Injury Prevention found that many Airbnb properties lack basic fire safety features. According to the study, 20 percent of Airbnb property owners did not report having smoke alarms; 42.5 percent did not report having carbon monoxide alarms; and 58 percent didn’t report having fire extinguishers. While fire safety advocates have urged Airbnb and similar vacation or short-term rental companies to enforce current National Fire Protection Association fire safety standards, without uniform regulation across the country, it’s essential that travelers be proactive about fire safety at their home away from home. Do your homework before making a reservation. You should be able to find more information about local regulations online, which you can then discuss with the host before arrival. This is a good time to discuss the property’s preparedness for other emergencies (such as a power outage or natural disaster). Make a list that includes the property’s address, local emergency numbers, emergency contact information for the owner and notes from the owner about all escape routes/exits. Each room should have at least two ways to escape during an emergency. Working smoke alarms on every level of the home, in every sleeping room and outside each sleeping area, as well as carbon monoxide alarms on every level of the home and outside each sleeping area. Portable fire extinguishers that are easy to reach. Exterior doors and windows that are easy to open. Pathways clear of any tripping hazards. By following this simple checklist and acting as your own fire safety advocate, you can relax and know that your vacation won’t go up in smoke! We work hard to protect our homes from fire, by installing and regularly testing smoke alarms, avoiding common fire hazards and teaching fire safety to family members of all ages. But do you know how to practice fire safety when you’re out in public places? A fire can happen anywhere, anytime, and in an unfamiliar setting, it’s easy to panic. The National Fire Protection Association has put together some suggestions to help you feel safe wherever you go! Before you enter any public building, take a good look around and make sure it feels safe, well maintained and easy to exit. You should have a clearly communicated exit plan, as well as an agreed-upon meeting point and a designated emergency contact in case you need to leave the building quickly. You should locate all available exits; plan to use the closest exit, as the main exit might not always be accessible during an emergency. After identifying all available exits, you’ll want to make sure the path to each exit is clear, and that exit doors are not blocked or chained. Public spaces should have at least two clear exits. Take note of any other possible fire hazards, such as overcrowding, unsafe heat sources, pyrotechnics or lack of standard safety systems such as sprinklers and smoke alarms. If you do not feel safe in the building, leave immediately. If necessary, report violations to building management and the local fire marshal. The best thing you can do in the face of a fire is to react immediately. “If an alarm sounds, you see smoke or fire, or some other unusual disturbance immediately exit the building in an orderly fashion,” the NFPA warns. Then, get out — and stay out! — so that trained firefighters can conduct rescue operations. For more safety tips, visit nfpa.org. No one wants to miss out on Aug. 21’s total solar eclipse. Here are some CCFR-approved tips to make sure you and your family are able to enjoy this once-in-a-lifetime event safely! The most-often given piece of eclipse safety advice — don’t look directly at it — can’t be given often enough. Looking directly at a solar eclipse can result in permanent vision loss. Instead, viewers should wear an approved pair of solar viewers, purchased from a reputable manufacturer and featuring an ISO 12312-2 certification. Eclipse glasses are thousands of times darker than regular sunglasses and block out all other light. Keep a close eye on curious kids, who might be tempted to take their glasses off, or keep them indoors until the two or so minutes of totality, when it is safe to view the eclipse without solar viewers. Not everyone in St. Louis is in the path of totality; click here for NASA’s map to determine where your location falls in the path. Do not stop or park on the side of the highway. Not only is it a traffic violation for motorists to stop on a highway unless they’re experiencing an emergency, it increases the likelihood of an accident. Do not take your eyes off the road to view the eclipse or use cellphones or cameras while driving to photograph the eclipse. Do not wear eclipse safety glasses while driving. The glasses filter out most visible light, essentially blinding motorists. Those living or staying inside or near the path of totality should avoid unnecessary road travel on Monday due to the increased volume. If you’re behind the wheel when the sun is entirely or mostly blocked, turn on your headlights. Depending on your location, when the eclipse appears will vary. Plan travel accordingly if possible. Being prepared before, and knowing what to do after the storm hits are critical to the safety of those who experience severe weather. Practice your emergency escape plan; know two ways out of each room of the house. Purchase a NOAA Weather Radio. Charge cell phones, or other battery-operated devices that can keep you aware of severe weather. Remember that a warning means that severe weather has been reported in the area, while a watch means that conditions are favorable. Keep the NOAA radio on. If you do not have one, stay tuned to local television or radio news. If you hear the severe weather sirens, head to the basement or a room on the lowest level of the house with no windows immediately. “Most injuries are caused by flying debris, so do whatever possible to find cover,” says Mason. If you see a green colored sky, large hail, a large, dark, low-lying cloud or hear a loud roar that sounds like a freight train take cover immediately. Avoid downed power lines, and items touching these lines. Do not move seriously injured people unless they are in immediate danger of further injury. Be cautious of exposed nails and broken glass. If it is dark do not use candles or any open flames, use a flashlight. Call 911 immediately if anyone is injured, you see frayed wiring or sparks, the odor of something burning, or a gas odor. It’s simple, working smoke alarms save lives. Three of every five home fire deaths resulted from fires in homes with no smoke alarms or no working smoke alarms. CCFR encourages everyone to take two minutes on the second of every month to check their smoke alarms.You can test your alarm by pressing the test button in the center of the alarm. If you cannot reach your smoke alarm, cannot change the batteries, or have other questions about your smoke alarm contact CCFR for complimentary assistance at 636.970.9700 or email us. Millions of toy boxes, storage containers and hope chests have lids that automatically latch shut, or can close suddenly. This can be deadly if a child climbs inside. The recent death of two children prompted the Consumer Product Safety Commission to renew its warning to consumers about the dangers of these boxes. Click here for details. In 2004 Facebook was launched and Friends left our televisions. It seems like yesterday, but if that’s the last time you replaced your smoke alarms it’s time for a change. “Working smoke detectors are critical to saving lives in a house fire, and as they age they become less reliable,” says CCFR Chief Russ Mason. As the electrical components in the alarms get older they become more susceptible to false alarms and other problems. Standard battery operated smoke alarm batteries need to be replaced every six months. Long lasting battery smoke alarms should be replaced according to the manufacturer’s instructions. Hard-wired smoke alarms should have the back-up battery replaced once a year. If you do not know how, or cannot replace your smoke alarm batteries, cannot afford a smoke alarm, or have other smoke alarm questions CCFR can provide complimentary assistance. Call CCFR at 636.970.9700, or e-mail us for details. Download our smoke detector brochure, or learn more here. Two spontaneous combustion fires hit local businesses. Spontaneous combustion fires may sound like something out of a science fiction movie; unfortunately it is a dangerous situation that has hit two local businesses in the past year. In both of the incidents, freshly laundered towels placed on a counter caused a chemical reaction to occur, and a fire ensued. When towels or other linens soiled with cooking oil or cleaning chemicals are washed in a normal washer and dryer they are not truly clean; residue remains on the linens. The heat of the dryer can start and accelerate the spontaneous heating process of the oil residue left in the towels. When they are piled together the heat has no way to escape and the natural material continues to heat up until a fire occurs. A similar reaction can occur if a washer or dryer used to launder soiled linens is not cleaned and well maintained. We highly recommend that you send your laundry out to a commercial laundry service that has the proper equipment to handle these volatile oils and cleaning chemicals. Use a commercial laundry service. Follow the manufacturer’s instructions on all cleaning supplies and equipment. Do not leave items soiled by oil or other flammable items in a pile, even if they are freshly laundered. Make sure that the washer and dryer are clean and well maintained. If rags have been used for painting, wood-finishing or oil-based projects, hang them outside to dry, or place them in an airtight metal container that is placed away from the building, and do not launder them. If you have any questions about how to keep your business safe, or if you would like CCFR firefighters to provide complimentary employee training on fire extinguisher usage, or other safety topics please do not hesitate to call us at 636.970.9700 or send us an email. With your help we can keep our community safe. It only takes a second for a kitchen fire to start when someone steps away to answer a phone call, leaves a dishtowel too close to the stove, or overfills a frying pan with oil. These types of accidents result in more than 100,000 home fires every year according to the National Fire Protection Association (NFPA). As part of its Fire Prevention Month, Central County Fire & Rescue (CCFR) is working to prevent these accidents by building awareness about kitchen fire prevention throughout October. Stay in the kitchen when you are frying, grilling, broiling, or boiling food. If you must leave the room, even for a short period of time, turn off the stove. When you are simmering, baking, or roasting food, check it regularly, stay in the home, and use a timer to remind you. If you have young children, use the stove’s back burners whenever possible. Keep children and pets at least three away from the stove. When you cook, wear clothing with tight-fitting sleeves. Keep potholders, oven mitts, wooden utensils, paper and plastic bags, towels, and anything else that can burn, away from your stovetop. Clean up food and grease from burners and stovetops. Throughout the month, CCFR firefighters will present safety lessons to kindergarten through third grade classrooms throughout the fire district. 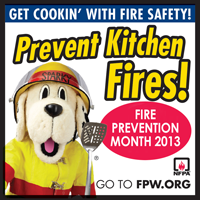 Kitchen fire prevention information will also be distributed at community events and through the District’s enewsletter and website. CCFR’s Fire Prevention Month is in conjunction with NFPA’s Fire Prevention Week, which is the longest running public health and safety observance on record.